While doing some research for a potential post, I was going back and reviewing some of the obvious and indisputably false statements made by creationists that I have documented here on PCwP and in doing so discovered that Answers in Genesis has relegated one of these blunders to the memory hole. In this case, it seems that AiG would rather we forget that their in house “anatomist”, Dr. David Menton, apparently cannot keep his saurischian (“lizard hipped”) dinosaurs and his ornithischian (“bird hipped”) dinosaurs straight—a basic distinction that any child interested in dinosaurs knows. This by itself would be reason enough to revisit Dr. Menton’s article however an even better reason might be the fact that the interwebs is currently abuzz with the news that Bill Nye (The Science Guy) has agreed, perhaps unwisely, to debate creationist preacher Ken Ham—Dr. Menton’s boss at AiG—this coming February 4th (2014). I believe what follows should give the reader some insight into both the commitment to principled scholarship and the scientific caliber of the people behind Answers in Genesis. As I noted in back in my February 2009 post, “Four and twenty sauropods baked in a pie“, Menton erroneously identified sauropod dinosaurs—long necked giants like Apatosaurus, a.k.a brontosaurus—as being “bird-hipped”, or ornithischian, dinosaurs, making a point of how un-birdlike these massive dinosaurs were, in an article titled “Did Dinosaurs Turn Into Birds?“. As you can see, the inaccurate listing of saurischian sauropods, as ornithischians, has become an accurate listing of some actual ornithischians. Which is all well and good, however there is no asterisk, no editor’s note, no update, nothing to let their readers know about this rather spectacular error or the changes made to correct it. It is just gone as if it never happened. Way to be intellectually honest Answers in Genesis! I will not rehash all the information about the similarities between the hipbones of theropod dinosaurs and various birds, both fossil and living, you can go back and look at my previous post on Menton’s mistake for that. However I am going to take a run at his attempted insinuation (in the last sentence quoted above) that paleontologists are somehow embarrassed by the fact that ornithischian dinosaurs, with their bird-like hips, were otherwise not particularly bird-like and therefore don’t like to bring them up when talking about bird origins. This makes sense only if you A) have a low very opinion of scientists and think they are involved in a conspiracy to hide things from the general public (which creationists do). And B) are wed to the idea that the superficial resemblance of one feature must imply a close evolutionary relationship; but who does this (aside from creationists that is)? These two paragraphs of Menton’s article are essentially an irrelevancy, which exists solely for making this innuendo. There may have been some 19th century paleontologists who were impressed by the superficial resemblance of the pelvic bones of ornithischians to those of birds but with very few exceptions (Galton 1970), this idea has been long abandon. If this is “rarely emphasized” in popular discussions of bird evolution it is because it is only of historical interest and not relevant to the current best science on the subject. That said, some popular works on the subject do in fact discuss it, even including discussions of the armored dinosaurs that Dr. Menton is so keen for us to consider. 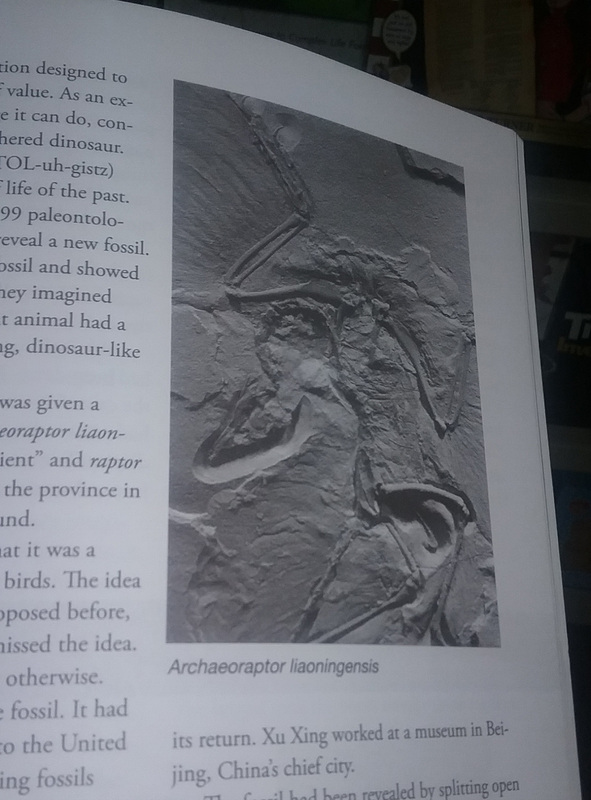 For example, pulling something of my bookshelf, there is a section of Lowell Dingus & Timothy Rowe’s book The Mistaken Extinction (1998, pp.170-177) where they go on for several pages discussing the different types of ornithischians and how they are, or rather are not, similar to birds. On the web, there is The University of California, Berkeley Museum of Paleontology’s website that talks about this on their page about ornithischians and hidden in the deep recesses of Wikipedia, where no one is likely to find them, there are multiple references to ornithischians in relation to birds. For example, both the “Origins” section of Wikipedia’s entry on the evolution of birds and the entry for ornithischia talk about ornithischians and birds. 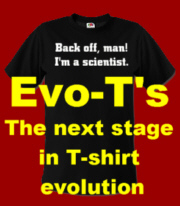 As you can see, it is all a big dark secret that evolutionists do not want getting around, so please, please, dear reader, do keep it to yourself. 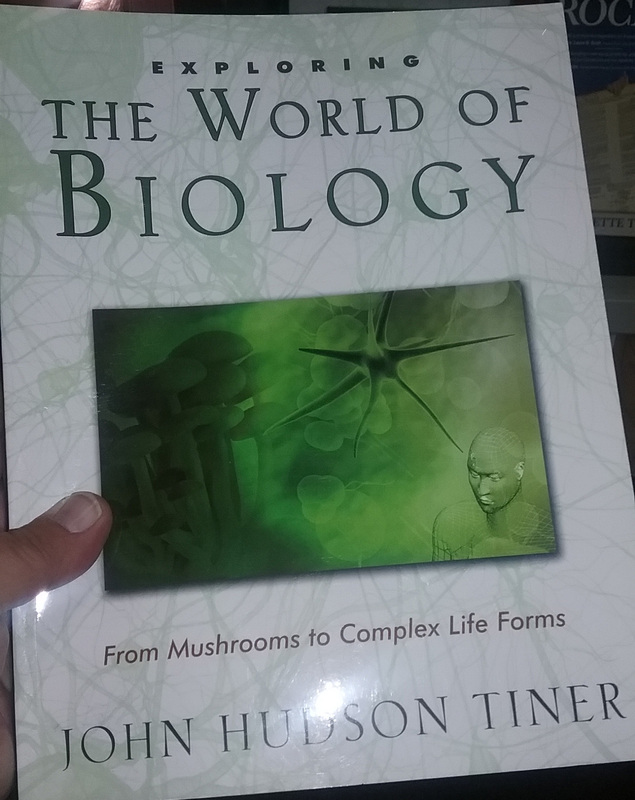 Of course here I have once again been picking the fly poop out of the pepper, taking time to quibble over something nuanced when I should be telling you about how Dr. Menton, has dropped another huge coprolite into our collective cornflakes. Menton: While evolutionists now agree that birds are related in some way to dinosaurs, they are divided over whether birds evolved from some early shared ancestor of the dinosaurs within the archosauria (which includes alligators, pterosaurs, plesiosaurs, ichthyosaurs, and thecodonts) or directly from advanced theropod dinosaurs (bipedal meat-eating dinosaurs, such as the wellknown [sic] Tyrannosaurus rex). The latter view has gained in popularity since 1970, when John Ostrom discovered a rather “bird-like” early Cretaceous theropod dinosaur called Deinonychus. Without getting distracted with the false equivalency Dr. Menton makes between the minority, “(unknown) archosaur origin” camp and the majority “theropod origin” camp*, his description here of the feet of Deinonychus is wrong on at least two counts. 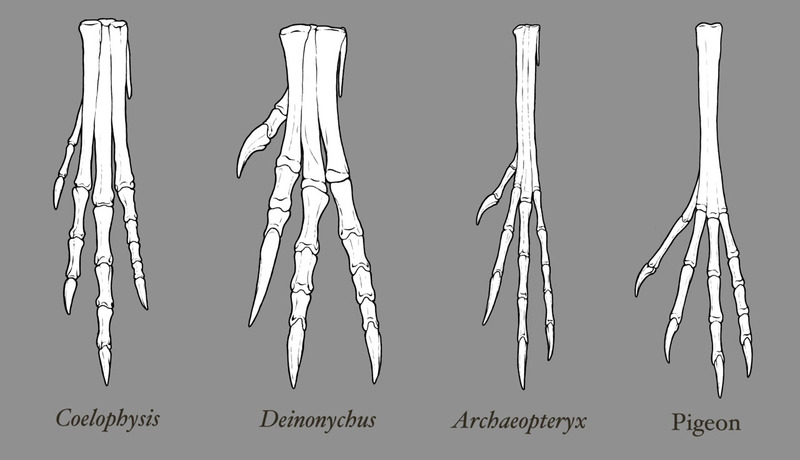 First, Deinonychus like most theropods (and birds) had four toes, not three as Dr. Menton states. In Deinonychus‘ case, three robust forward facing toes and one somewhat reduced backward facing toe—the fifth digit is reduced to a splint bone (Ostrom 1969, p.124). Comparative illustration composed by Emily Willoughby (used with permission). Second, the large curved claw that gives Deinonychus its name is on the anatomically second toe, not the third, which is the “middle” toe in tetrapods. Nor is it on the “middle toe” if we ignore the existence of Deinonychus‘ reduced first toe (hallux) and pretend it only had three forward facing toes. 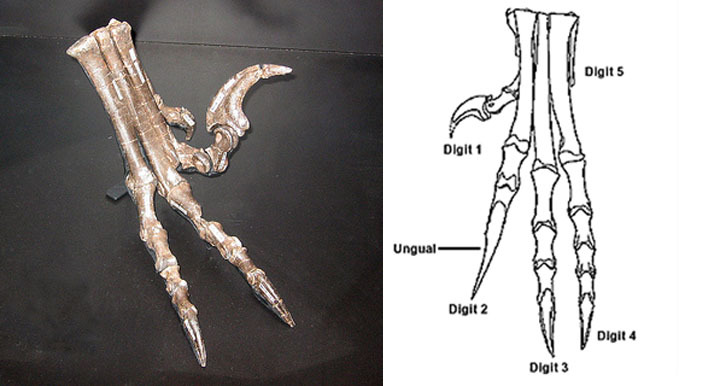 Even in this case the enlarged toe claws of Deinonychus are on the inside toes of its feet, not the middle toes. The photograph on the left is by Denver W. Fowler and was taken of a specimen on display at Museum or the Rockies, Bozeman, Montana (used with permission, for more on Deinonychus see Fowler et al., 2011). The drawing on the right is from the Yale Peabody Museum website. So no matter how you count these little piggies, whether from a technical anatomical perspective, or just informally, Dr. Menton, creationist anatomist extraordinaire, is mistaken once again. This leads to a couple of questions. If Dr. Menton does not know such basic facts as, what types of dinosaurs are ornithischians or saurischians, how many toes theropod dinosaurs had, or which toes are which, why should anyone take his opinions on the more complex question of the evolutionary relationship between theropods and birds seriously? And why would anyone put their trust in Answers in Genesis as a reliable source of information if they apparently willing to cover up this sort of ignorance, which had been on their site, misinforming their readers for years, by quietly changing things without any sort of notice or acknowledgement? I leave the answers to the reader. There is much more in Menton’s article that needs to be addressed and I am going to separate those into a second post. However, there is one last statement by Menton to attend to here. You see just about right in the middle of his article Menton dropped an anti-science bomb that seems to render the rest of his arguments effectively meaningless. I’ll save my barbs about the platypus, feathered mammals and “sceathers”, for part two, because the main point here (which makes those things and pretty much everything else in his article irrelevant) is Menton’s offhanded dismissal of the significance such things as feathered dinosaurs. His statement essentially boils down to an argument that such things as feathered dinosaurs, fish with feet or “ape-men”—you know, transitional or intermediate forms—are merely the creations of a whimsical deity who chose to arbitrarily to mix and match characteristics of different groups of organisms and are therefore irrelevant. After all God can make anything, in anyway he chooses and for any reason he see fit to do so. This is also known as “using the miracle card” or an appeal to magic. Dr. Menton is of course free to do this; however, in doing so he abandons all pretence of doing science, or even attempting to make rational arguments. Why does he bother arguing about different anatomical or physiological features of dinosaurs and birds? Why does he bother to fold, spindle, or mutilate the facts about these things and to misquote scientists regarding them (more on this in part two), if in the end you just going to say, “regardless of the facts, it is the way it is because God did it that way, period”? It would save everyone a lot of time if he just said this sort of thing up front, so that rational people, who actually accept science and who care about the facts, will know that his claims can be dismissed without further consideration. So, those are the major things I wanted to address first—and where some of you might want to stop and get off—however, for those of you who are gluttons for punishment, there is, as I said, much more in Dr. Menton’s article that is of false and or misleading nature to be addressed. I will examine those in a separate post. *Alan Feduccia is part of a shrinking minority of scientists who deny the evidence that birds evolved from theropod dinosaurs in favor of an older hypothesis that birds evolved from an earlier unknown group of archosaurs (a group that includes crocodilians, pterosaurs, dinosaurs and smattering of other extinct types). Their frequent and often strident attacks on the evidence that birds evolved from theropod dinosaurs make Feduccia, and others like him (the late Larry Martin for example), the go to scientists for creationists to quote on the subject of bird evolution. 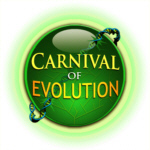 Creationists use their attacks on the mainstream view of bird evolution to try to cast doubt on whether birds evolved at all. As I continue to try and adapt to having a significantly longer commute to work, settle into our rental house, and generally try to get my crap together, here are some pictures of some critters I’ve encountered over the last few months. This dangerous little bugger was hitchhiking in a load of horse manure that my mother was unloading from the back of her pickup truck. 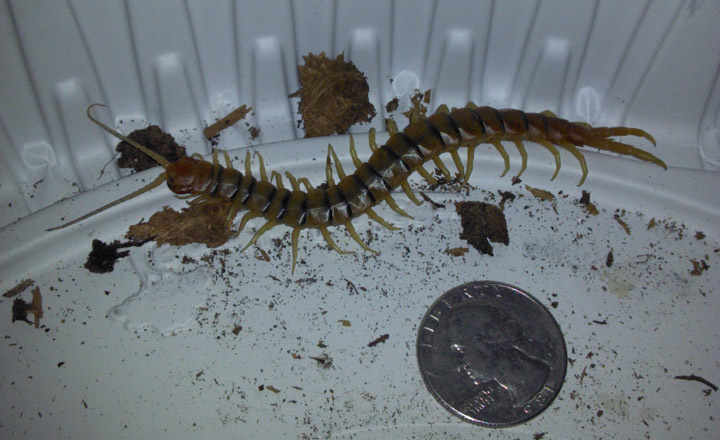 A centipede, probably a Scolopendra polymorpha. After I told my mother that I wasn’t interested in adopting it she ended up feeding it to her chickens, which was probably a little spicier than their usual fare. 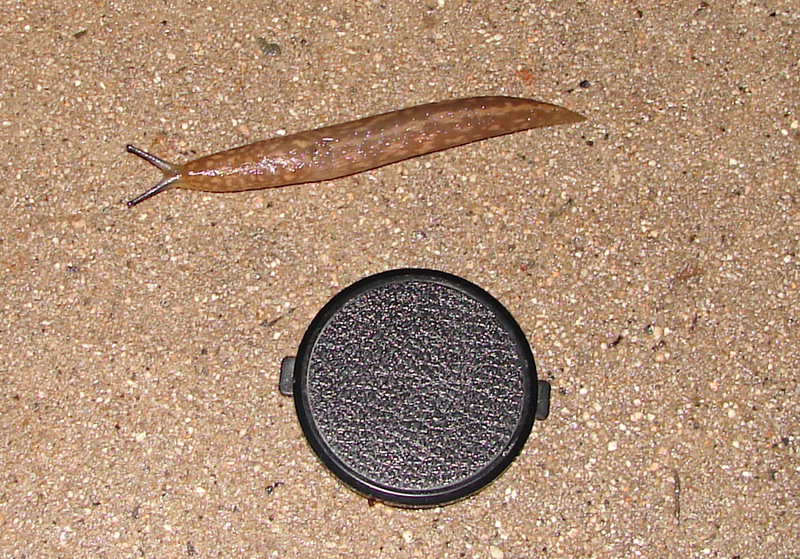 OK, there is a bit of a set up to our next crawly, or rather swimy critter. I was on my way to work one morning and while driving by a vacant lot around the corner from my house, I noticed three adults standing around a large puddle in middle of the lot that was left over from some recent rain. My brain noted that this was an unusual thing to see, so I slowed down a bit and saw that a couple of them were holding small fishnets, of the sort that an aquarist might keep handy. Quickly running through the possibilities of what three adults with fishnets standing around a small ephemeral body of water in a generally arid environment might be up to and my brain instantly hit upon what seemed to be the only logical conclusion…BIOLOGISTS! Unfortunately I was already a little late for work and couldn’t stop and talk to them, however I immediately vowed to myself that I would visit the puddle ASAP to see what might have drawn a trio of probable biologists to this vacant lot. So on my way home from work I stopped at the lot and checked out the puddle. At first I didn’t see anything but once my eyes adjusted to what I was looking at I noted some small (maybe 2cm) things swimming fairly vigorously around the puddle. At first I thought that they might be fish, perhaps Gambusia which are often stocked in our local waterways to control mosquitoes. This wasn’t totally crazy as there is a catchment basin immediately adjacent to the lot and I thought that, while it was unlikely, it might be possible for some Gambusia to have somehow made it into this puddle. However given that this was a very ephemeral body of water and that Gambusia would be considered “junk fish” by an ichthyologist I quickly dismissed this idea. Looking a bit closer at the tiny swimming creatures I realized what their true nature was and why thy might be of interest to biologists became much less of a mystery. 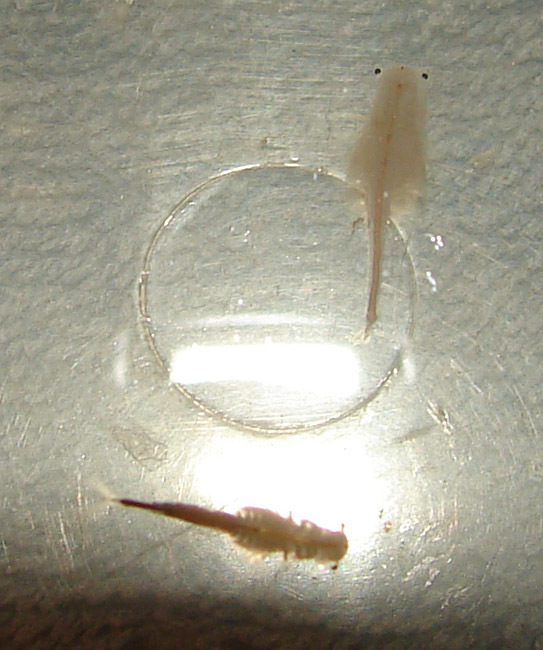 They were fairy shrimp, possibly of the Family Streptocephalidae, some members of which are very endangered. 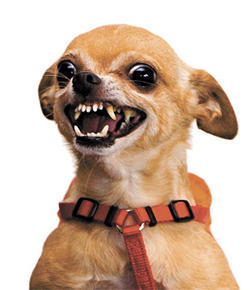 In this case possibly Streptocephalus woottoni A.K.A. 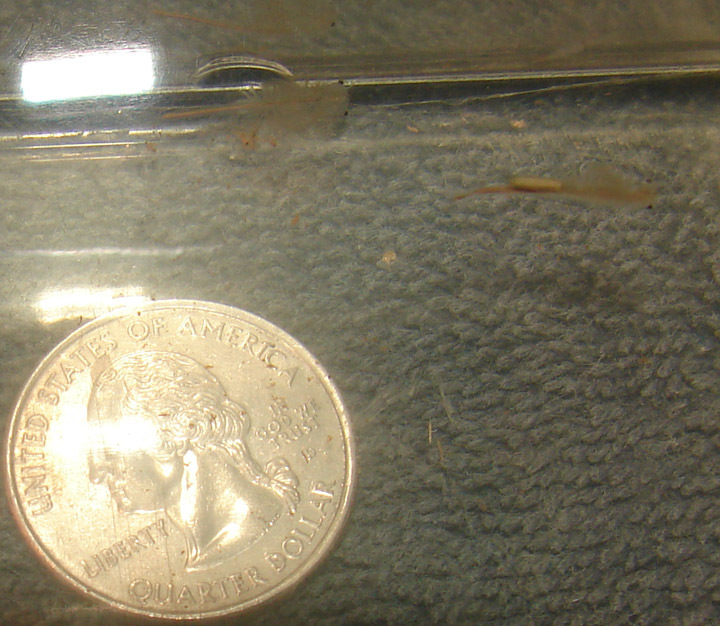 the “Riverside fairy shrimp“, though this puddle was a little shallow (under 30mm) for the normal bodies of water that S. woottoni are supposed to inhabit. Anyway, after seeing that they were indeed fairy shrimp I rushed home and got one of my critter keepers (a small plastic aquarium) and fashioned a small, pitiful, net out of a coat-hanger and one of my wife’s old nylon stockings. Pitiful as my jury-rigged net was, it allowed me to catch a few of the shrimp. Fear not for the shrimp though, after I photographed them (which isn’t an easy thing!) I returned them to their puddle which remained habitable for three or four days longer. While driving through a local rural area (Reche Canyon) my wife and I spotted a herd of feral burros (Equus africanus asinus) that we had heard (get it?) lived in the area. I wasn’t able to get too close to them and only had my cell phone camera so these are not the best pictures. However if you look carefully at the second picture below you’ll get a glimpse of some “hot donkey action” going down (brown chicken, brown cow!). Apparently there is something of a mystery involving these burros lately. It seems that several of the newborns have gone missing and it becoming a concern for the locals who watch over them. Finally a rough pair of middle aged male apes (H. sapiens). 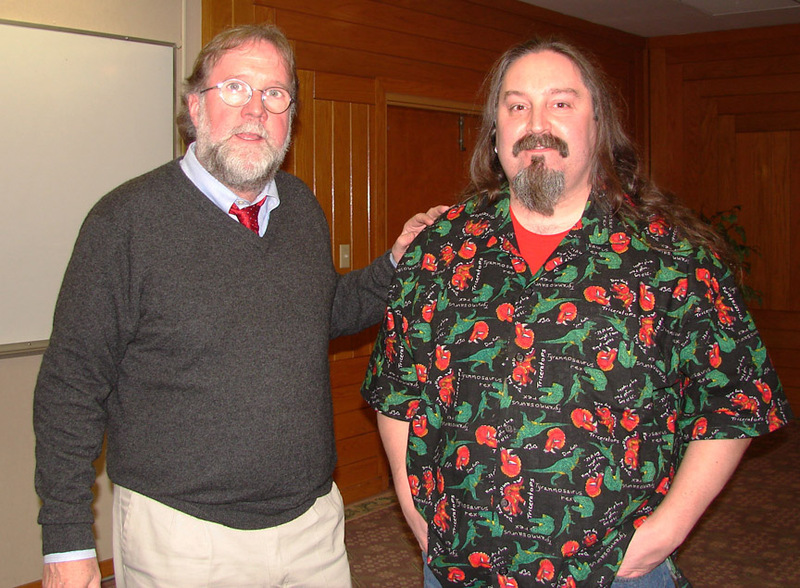 Yours truly with Dr. Sean B. Carroll Professor of Molecular Biology, Genetics, and Medical Genetics at the University of Wisconsin–Madison at U.C. Riverside on 2-11-2013. Dr. Carroll had just given a very entertaining talk: Remarkable Creatures: Epic Adventures in the Search for the Origins of Species about the adventures and scientific contributions of Alfred Russel Wallace, Charles Darwin and Henry Walter Bates in honor of Darwin Day 2013 (Photo and my shirt by Lani Britain, a.k.a. Mom).